Whether you choose to kayak or paddleboard for your yoga session you will be connecting with nature in the most unique way. Treat your senses to a session or two in the most naturally beautiful studio in Sydney. 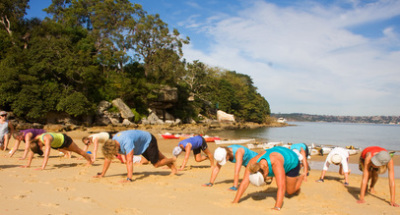 Take your fitness journey to the next level with a Kayak Fitness class. Sessions involve a full body work out with a mixture of the basic skills of kayaking. What does your gym look like? Kayak and SUP Fitness and Yoga classes provide a perfect way to get fit while outdoors enjoying pristine beaches and waterways. "I absolutely love the kayaking & yoga classes, its the best way to start off your weekend, with a great activity and being at one with the beautiful nature!"